↑ The Arabidopsis Genome Initiative (2000). 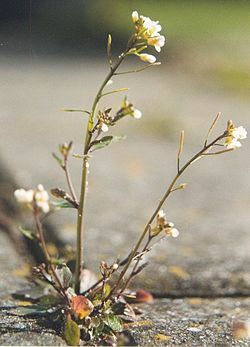 "Analysis of the genome sequence of the flowering plant Arabidopsis thaliana". Nature 408 (6814): 796–815. doi:10.1038/35048692. PMID 11130711. ↑ "TAIR - genome annotation:". ↑ "Integr8 - A. thaliana genome statistics:". This page was last changed on 24 April 2018, at 18:24.